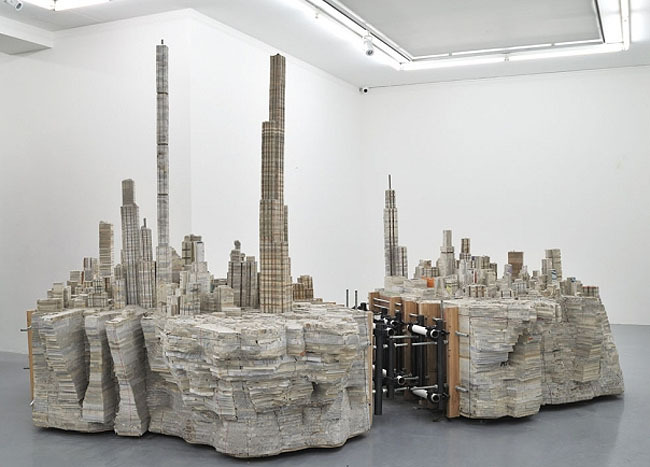 Chinese artist Liu Wei creates soaring skyscrapers and rising metropolises by stacking recycled text books atop one another and holding them in place with metal rods. The chaotic city snippets reflect the artist’s experience with the rapid growth of his hometown of Beijing. Unlike other book sculptures, Wei’s pieces are rough, crumbling and unfinished, completely betraying their origination as crisp text books. The carved pages possess a soft quality, which fuels the feeling of hurried chaos that Wei feels in the construction of new buildings in China. The city sculptures appear to have a lot going on at once, in a mess of construction confusion, much like the constant redevelopment of Beijing. The nearly unrecognizable text books are neatly stacked in rows, and held in place securely. As if a slab of marble, the blocks are then carved into the intricate structures of a gridded city. The varying structures, some seeming to soar to heights of the Burj Khalifa, are perched upon a thick base of books carved to look like bedrock, or a cross-section cut from the Earth’s crust. Although the cities are anonymous, each features recognizable shapes from around the world, like the Pentagon, Saint Peter’s Basilica and the Empire State Building. In each island-city’s rows of skyscrapers, apartment buildings and municipal looking structures, the dust from the carving process has been left to fester, creating a post-Apocalyptic or Dystopian feel. Wei’s pieces are part of an exhibition at Paris’ Almine Rech Gallery, that runs until May 16. Unlike other book sculptures, Wei’s pieces are rough, crumbling and unfinished, completely betraying their origination as crisp text books. The carved pages possess a soft quality, which fuels the feeling of hurried chaos that Wei feels in the construction of new buildings in China. The city sculptures appear to have a lot going on at once, in a mess of construction confusion, much like the constant redevelopment of Beijing. The nearly unrecognizable text books are neatly stacked in rows, and held in place securely. 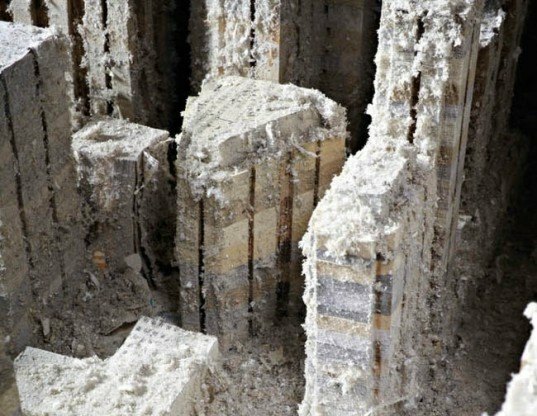 As if a slab of marble, Wei then begins carving the joined block of books, into the intricate structures of a gridded city. The varying structures, some seeming to sear to heights of the Burj Khalifa, are perched upon a thick base of books carved to look like bedrock, or a cross section cut from the Earth’s crust. Although the cities are anonymous, each features recognizable shapes from around the world, like the Pentagon, Saint Peter’s Basilica and the Empire State Building. In each island-city’s rows of skyscrapers, apartment buildings and municipal looking structures, the dust from the carving process has been left to fester, creating a post-Apocalyptic or Dystopian feel.